MMA fan? 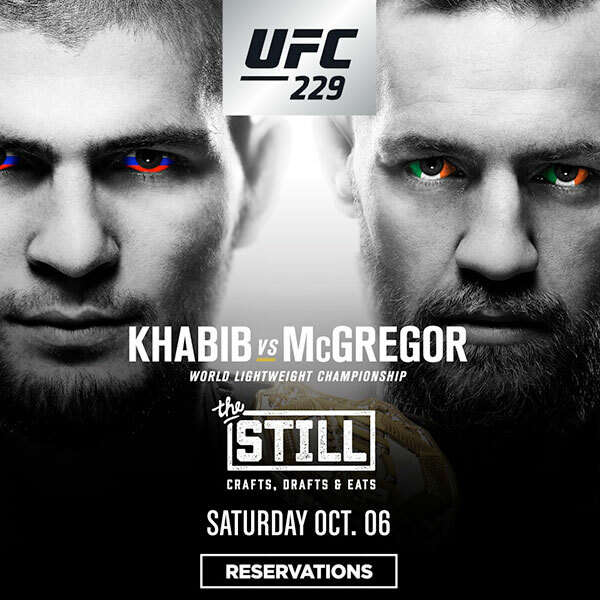 Then we know right where you’ll be on Saturday, October 6th – watching the UFC 229 fight between Khabib Nurmagomedov and Conor McGregor. And if you’re looking for the perfect place to watch the big fight with your friends, then join us at The Still. Nestled right in the heart of Las Vegas, we’ll have the fight on all of the TV screens and there won’t be a bad seat in the house. UFC 229 promises to be one of the best fights of the year, and all eyes are on this lightweight fighter matchup. In his comeback fight, McGregor will take on wrestling champion Nurmagomedov. This past April, McGregor captured the nation’s attention when he was captured on video throwing guard rails at a bus that was transporting UFC fighters. Two of the fighters were hospitalized as a result. The assault was an apparent confrontation of Nurmagomedov, who was on the bus at the time and who had slapped Artem Lobov, McGregor’s friend. Needless to say, when the two fighters meet in the ring in Las Vegas in just a few weeks, the atmosphere is sure to be charged. Who Will Win UFC 229? Which fighter will emerge victorious? It largely depends on how the fight goes. McGregor is returning from almost two years away from competition. He’s a controversial fighter and is known for his trash talking. Worth about $34 million according to Forbes, McGregor spent a vacation in Ibiza in 2017, living life up with plenty of partying and even a jaunt on a yacht. Nurmagomedov promises to be a challenging match for McGregor. He became champion in the lightweight division while McGregor was absent from competition. Nurmagomedov’s incredible strength and talents in grappling should help him to fend off McGregor – plus he has a title to defend. According to McGregor’s post, his company will make a donation to the first responders in each district that a case of the whiskey is sold in. “These are the men and women who run into buildings while everyone else is running out. They are our real life heroes,” wrote McGregor. After you’ve tried your luck with the slots or the card tables, you can join us to watch the fight and see if your pick comes out on top. Our great menu of delicious table snacks ensures that you’ll have plenty to eat during the entire duration of the fight. Looking for something a little bit different? Maybe one of our craft beers is the right choice for you. Ready to support your favorite fighter in UFC 229? Then come down and watch the fight at The Still. With our great atmosphere, delicious foods, and amazing drinks, you couldn’t choose a better place to watch this highly anticipated fight.